This Classic trip showcases some of the best that Africa has to offer. 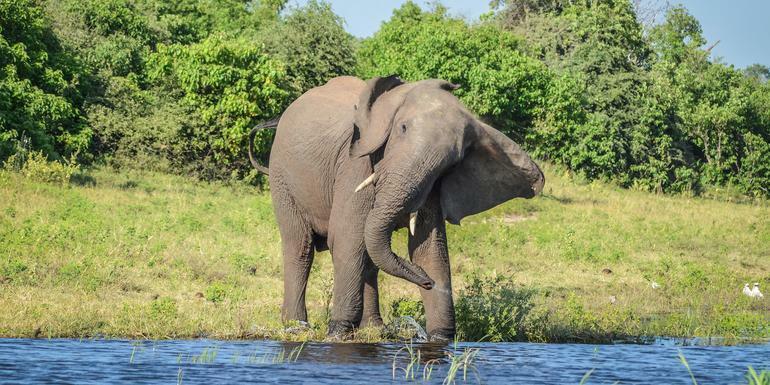 Journey from Namibia, across Botswana and on to Zimbabwe on an authentic African adventure that includes the elephants of Chobe National Park. Meet San Bushmen in the blazing Kalahari and explore the Okavango Delta by dugout mokoro canoe. A knowledgeable Chief Experience Officer will ensure your accommodation will provide the most authentic travel experience possible, including a night camping in the Delta, for a bedtime you'll never forget. Depart at any time. Additional Notes: We highly recommend booking post-accommodation to fully experience everything Victoria Falls and the Zambezi area has to offer. Only ground transport Air-conditioned touring vehicle, walking, mokoro, safari vehicle. 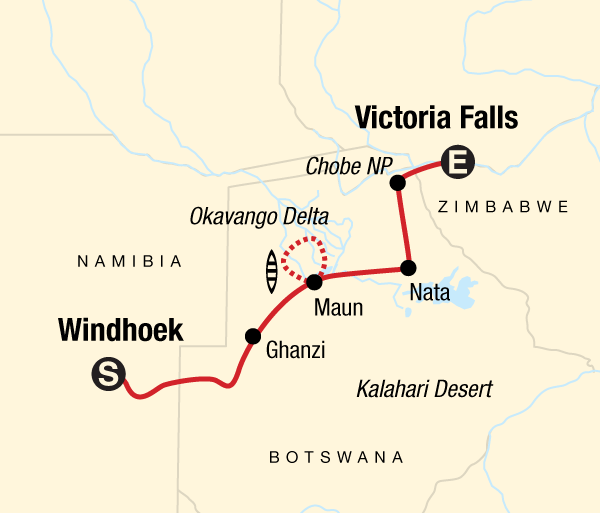 For all of our standard class trips in southern Africa, including this tour, we use a private local bus for the journey. With air conditioning, and sliding windows, this style of transportation is a comfortable way to travel through the region. In addition, even with a full group of 18 travelers, there will be extra space for the benefit of the group. Having our own private vehicle throughout the tour allows us the flexibility of making stops when needed. In addition, we are able to travel to out-of-the-way locations where public transportation does not reach. Road conditions in the region can range from good to very poor. As such, we slow our traveling speed in the rough spots and enjoy some sand and bumps en route – something which is of course part of the adventure of traveling in Africa! In the Okavango Delta, we leave our bus behind and explore in the area in mokoros – traditional dug-out canoes. The mokoros usually seat 2 people and are handled by ‘polers’ – so named as they move the mokoro forward by using a very long pole pushed into the ground under the water. This is a relaxing and peaceful way to take in the fascinating environment and wonderful scenery of the delta. Hotel 2 nights in comfortable twin rooms with en suite or shared facilities. Cabin/Huts 1 night are spent in simple Hut. Rooms are twin or single with shared facilities. Lodge 1 night in standard rooms with en-suite facilities. Adventure Tents 2 nights are spent in simple Dorm/Adventure tents. Rooms are twin or single with shared facilities. Basic Camping (participative, please bring your sleeping bag and towel) 1 night is spent in pitched tents in the Delta with very basic facilities (no shower, dig-out toilet). Tents are twin. Guides Chief Experience Officer (CEO)/driver throughout, local guides. 1.This is not a physically demanding journey; however, travelling can be difficult, with long drives and poor road conditions at times. Despite this, most clients feel that the diversity of the African landscape, countries, culture and wildlife are all well worth the experience. We use a comfortable and safe air-conditioned vehicle for the long drives. 2. Please note that this tour combines with other G Adventures tours. As such, the staff and some travel companions on your tour may have previously been traveling together with G Adventures, prior to Day 1 of your tour. Likewise, some staff and travel companions may be continuing together on another G Adventures tour, after your trip concludes. 3. According to the WHO and CDC, there is no risk of yellow fever in Botswana. It is compulsory to show a valid Yellow Fever vaccination certificate if you are travelling to Botswana from a Yellow Fever endemic country, or have recently travelled to a Yellow Fever endemic country (with entry stamps in your passport), including the following countries (but not limited to): Angola, Benin, Burkina Faso, Burundi, Cameroon, Central African Republic, Chad, Congo, Democratic Republic of the Congo, Republic of the Cote d’Ivoire (Ivory Coast) Equatorial Guinea, Ethiopia, Gabon, Gambia, Ghana, Guinea Zambia, Guinea-Bissau, Kenya, Liberia, Mali, Mauritania, Niger, Nigeria, Rwanda, São Tomé and Príncipe, Senegal, Sierra Leone, Somalia, Sudan, Tanzania, Togo, Uganda, Argentina, Bolivia, Brazil, Colombia, Ecuador, French Guiana, Guyana, Panama, Paraguay, Peru, Suriname, Trinidad and Tobago, Venezuela. **We advise all travelers to Botswana who are coming from one of the above countries, or who have visited them in the last 10 years, to be prepared with a Yellow Fever vaccination certificate or letter from your doctor with proof of vaccination. Yellow Fever inoculations need to be administered at least 10 days prior to your entry into the country. Border officials in Botswana have been strictly enforcing these requirements. Travelers without the correct documentation run the risk of being denied entry, and will not be able to continue with the tour. (Any additional travel expenses will be on your own account.) ** 4.MONEY EXCHANGE We strongly advise that you bring ZAR or USD from your home country or exchange money before the start of the tour, to avoid delays on tour. Please see the Money Exchange section for more details. 5. DRONES The use of drones in national parks in Southern Africa is prohibited. Eating is a big part of travelling. Travelling with G Adventures you experience the vast array of wonderful food that is available in southern Africa. On this tour, we provide only a few meals for you and your group members, so as to give you the maximum flexibility in deciding where, what and with whom to eat. It also gives you more budgeting flexibility in you choices. Our groups tend to eat together to enable you to taste a larger variety of dishes and enjoy each other's company. There is no obligation to do this though - while in the larger centres, your CEO will be able to suggest favourite restaurants during your trip. Your CEO prepare the meals included in the Okavango Delta, arranging to purchase the foodstuffs before our bush camping excursion begins. Breakfasts will generally be cereals, if time allows a warm breakfast may be prepared. Lunches will be light meals such as sandwiches and/or salads. All evening meals will be freshly-prepared hot meals, and will consist of a variety of continental and local dishes. For the included meals, vegetarian meal requests and other dietary requirements need to be specified prior to arrival.